How Charismatic are the Candidates in the Labour Leadership Contest? Of the candidates, Jeremy Corbyn is located towards the middle of the table just above David Cameron. The other three are close to the relegation zone, battling it out with Andy Murray. Positions for the Labour Party candidates calculated after last rounds of hustings, July 22nd 2015, using the Castro Charismatic Scale. The ratings were from an email survey of 500 randomly selected LWD subscribers conducted over the period July 23-24th. 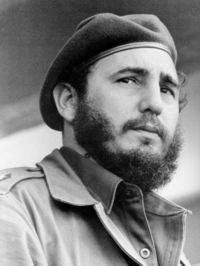 Fidel Castro holds the record for the number of consecutive appearances as No 1 in the table. Sir Alex Ferguson, who was regularly a top five finisher in the league over the last 20 years, had been excluded for insufficient Premier League appearances over the period 2014-2015. Position in the table is an indication of leadership style rather than an individual’s achievements or capabilities. This entry was posted on Sunday, July 26th, 2015 at 7:08 pm and is filed under Uncategorized. You can follow any responses to this entry through the RSS 2.0 feed. You can leave a response, or trackback from your own site.